Much of the following information is provided on the website of RCD Corporation and has been reprinted here with their permission. 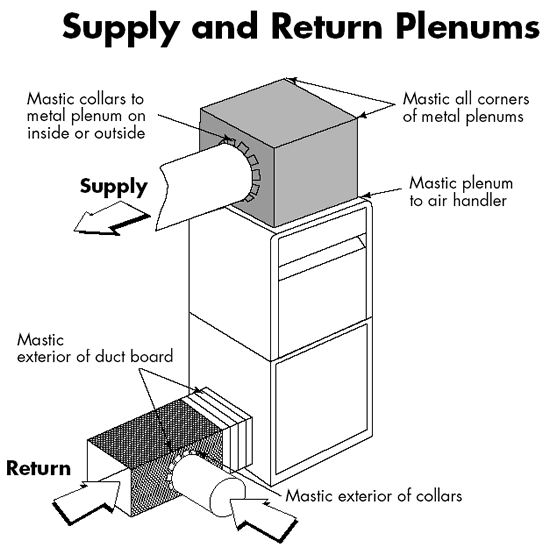 Why is sealing ductwork important? Leaky ductwork can account up to 30 percent of total heating and cooling costs. For an average home, leaky ducts can waste hundreds of dollars each year. While the increased energy costs and green house gas emissions are significant, health and safety are also a concern. Why is duct leakage so common? Most connections are simply not sealed. Those that are, may have been sealed with a poor quality material such as duct tape. Yes, ironically enough, duct tape is just about the worst material you could use to seal your ducts. Want proof, see these test results. If a tape is to be used, foil tape is a better choice. Even better is to use a mastic. A group of high strength adhesive compounds used in the building and construction trades. Usually applied by trowel, brush, or caulking gun. There are three general classifications: water-based; solvent-based; and two-component curing systems. Water-based is the safest and easiest to use. It performs as well and in some instances better than the other two classes. If ducts are insulated, do they need to be sealed? Yes. Insulation does not stop air leaks. Look for dirt streaks in duct insulation, they’re a sign that air has been leaking from the ducts. Are certain types of ducts more air tight? Studies show that all types of ductwork can have problems with air leakage. 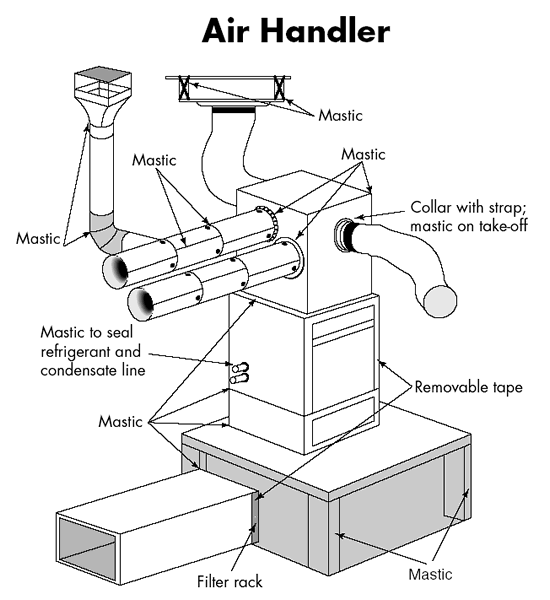 Mastic works to seal metal, flexible, and fibrous ductwork. 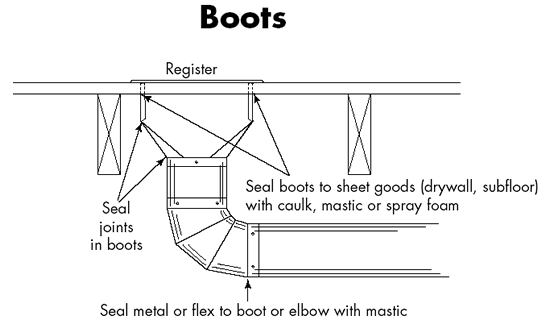 What are the most important areas to seal? 3. All seams in the air handling units and plenums, takeoffs, boots, and other connections, especially site-built items. What are the VOCs (volatile organic compounds) in mastics? In water-based mastics, the only volatile compound is water which is inorganic. Therefore the VOCs are infinitesimally small (not recordable). This is the reason water-based mastics pose a low health risk compared to solvent-based and two-component mastics. It is a good idea to apply mastic to all joints and seams, regardless of whether you can detect leakage. Thermal expansion and furnace vibration can loosen joints over time causing them to leak in the future unless they are sealed with a flexible material such as mastic. 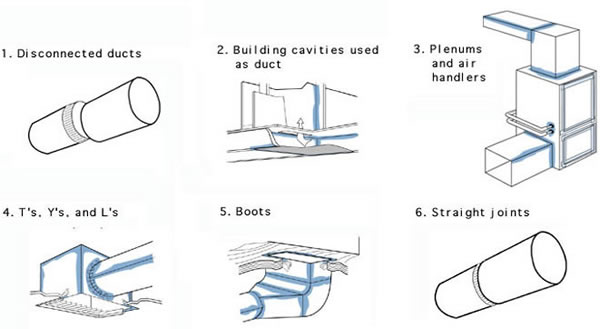 The following images show more detail about where to apply the mastic. Use a cloth to wipe dust from the surface of the duct. If oily film or grease covers the duct, wipe clean with a damp cloth. For gaps less than 1/4″, load the brush with mastic and coat the entire joint with a continuous strip. Use the end of the brush to work the mastic into joint. Spread the mastic at least one inch on each side of the joint. The mastic should be thick enough to hide the metal surface of the duct (about 1/16 inch thick). If the gap in the duct connection is larger than 1/4 inch use a fiberglass reinforcing membrane in addition to the mastic. If the membrane is sticky on one side, cut enough membrane to cover the joint, press the membrane in place, then cover it with mastic. Apply enough mastic to completely cover the membrane. If the membrane does not have a sticky side, first apply a thin layer of mastic, press the membrane into the mastic, then apply a finish layer of mastic. Water-based mastics generally dry to the touch in 2 to 4 hours. Insulation may be installed over wet mastic but try not to move the ducts too much, because the mastic seal could be damaged. All duct support work should be done before applying mastic. Home Depot – If this link doesn’t go to the proper product page, try searching for “duct sealant” or “mastic” on the Home Depot website. Good article. It helped me prepare and purchase the correct material before completing the job. Good article. And I would second that this is ABSOLUTELY worth doing. When I went to seal my ducts I found some serious problems. Addressing all of them has reduced my gas/electricity consumption by about 25%. It is too bad that sealing ducts is not code in Alberta. I found some serious leakage after reading this and preparing the ducts. Thanks! Good information. I’m redoing a dropped ceiling and all my heating ducts are exposed. I am going to be sealing them. This was very helpful, thank you for providing this information. I checked my ducts and I found holes bigger than my finger. This helped me find all the problems and now I am fixing them. Thanks for information, I am a beginner in construction industry and wanted to know how to seal pipes and ducts, now l can perform my job with knowledge. 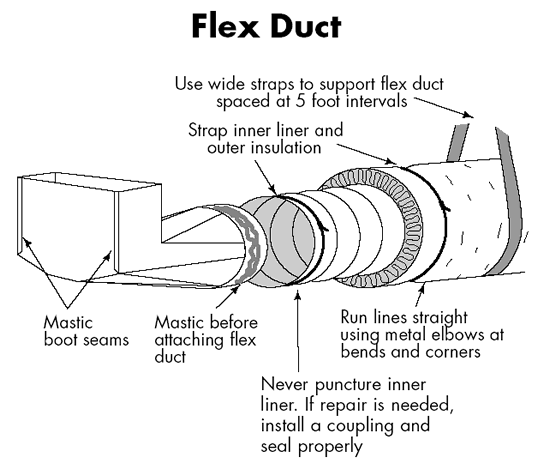 This information is great, I started sealing my ducts yesterday and thought I was almost done. After checking out this link, I see I have more work to do. The detailed pictures really help, thanks again. After eleven years living in this house, I finally had an energy audit performed. The auditors found that I have very leaky ducts. I decided to research and fix the problem myself. After only a very short while under the house, I found major leakage. Previous installers had used unapproved tapes and little to no mastic. I guess they figure the insulation will stop leaks? Some of the gaps are unbelievable. It’s going to be a tough job, and it’s going to take some time, but I’m going to do it right! Thank you so much for this invaluable information. I’ve been seeking information about the above subject from different sources: never been more professional, simple & brief with those clear & self-explained drawings.